UNAI EMERY HAS hailed Mesut Ozil for delivering when Arsenal ‘needed him to’ during their Premier League clash with Burnley. The Gunners headed into a home date with the Clarets looking to offer a positive response to back-to-back defeats in league and cup competition. Ozil’s role in their plans had dominated the pre-match build-up, with the German playmaker having seemingly fallen out of favour to see questions asked of his future. Emery had, however, stated prior to the game that the World Cup winner still had an important role to play and backed up that statement by handing the 30-year-old a starting berth and the captain’s armband. Ozil rewarded that show of faith with a talismanic performance which saw him play a pivotal role in Arsenal’s first and third goals in a 3-1 victory. Emery told BBC Sport afterwards of an eye-catching showing from a man with a point to prove: “It was a big performance today and afterwards I said congratulations for your work. Ozil was not the only player to deliver for Arsenal, with the Gunners’ defence standing up well to a physical battle with Burnley’s forward line. Emery was delighted with the collective showing from his side, as they returned to winning ways courtesy of two goals from Pierre-Emerick Aubameyang and a late effort from Alex Iwobi. The Spaniard added: “It was a tough match. It was difficult because they pushed a lot with long balls and the second action. “But we played well with our body and our character was good. The victory was deserved and in the table we are closer to Tottenham and Chelsea. “I think we won today not because we played well but because every player had a very big commitment. “We knew Burnley are an organised team and were going to push us but we didn’t lose too many long balls from the goalkeeper. “I think we can controlled the match like we wanted. We had to make an alteration of our game plan but after I think our game plan gave us the victory. Arsenal remain outside the Premier League’s top four at present, but remain very much within touching distance of the Champions League spots as the games come thick and fast during the festive period. Email “'It was a big performance': Emery hails Ozil after Arsenal's win over Burnley”. 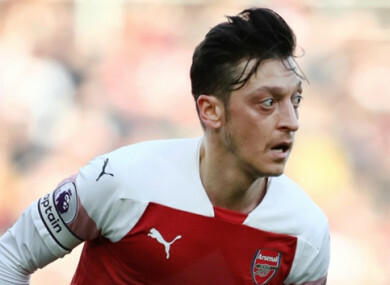 Feedback on “'It was a big performance': Emery hails Ozil after Arsenal's win over Burnley”.